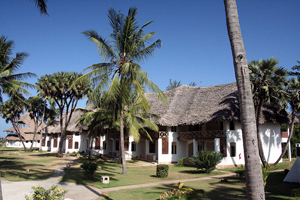 The Hotel Lawford in Malindi at Kenya’s northeast was reopened under italian management in 2006 after comprehensive renovation. There are 64 rooms on two floors and several houses with makuti ceilings. All rooms are very comfortable furnished and provides a balcony or a view-shielded veranda, air-condition and a private safe. From the restaurant with its huge, impressing makuti-ceiling one’s look goes directly to the tropical garden and also the ocean is always in one’s view. There are two pools, the smaller one is near the restaurant, the second one is in the middle of the botanic garden and has a pool-bar. The kitchen offers international standard, but focussed on italian style.